Catch a Florida Memory rewards anglers for their fishing achievements while supporting marine fisheries conservation. These programs encourage anglers to target a diverse array of species during fishing trips to help decrease fishing pressure on the most commonly sought-after catches. Whether you are new to fishing or a seasoned expert, Catch a Florida Memory is sure to add some excitement to any day out on the water. Learn more and submit catches at CatchaFloridaMemory.com. An FWC Grand Slam is catching three specified fish species in a 24-hour period. 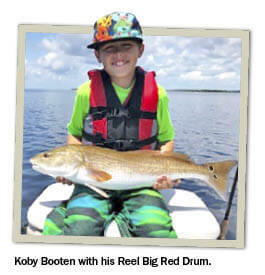 There are nine Grand Slam categories, from Inshore (red drum, spotted seatrout and flounder) to Blue Water (dolphinfish, sailfish and wahoo), and even a Small Fry Grand Slam for youth age 15 and under (pinfish, catfish and grunt). Successful anglers are not only awarded a certificate and t-shirt, but also receive recognition for every three or more different Grand Slams submitted and win a grand prize if all eligible slams are caught. Similar to a birding life list, the Saltwater Fish Life List allows anglers to track their progress at catching 70 species of saltwater fish. Anglers are rewarded for their achievements as they reach 10, 30, 50 and 70-Fish Club milestones. Plus, anglers who complete their Life List by submitting all 70 fish get a grand prize! Anglers are rewarded for catching memorable-sized saltwater fish in 30 different Reel Big Fish species categories. To qualify, fish must be legally caught and meet or exceed a minimum qualifying length. A photo of the fish on a length measuring device must be submitted, in addition to a photo of the angler with the fish. Successful anglers are awarded a certificate and t-shirt, as well as additional prizes for catching five, 10, 15 and 30 different Reel Big Fish species. Anglers who submit all 30 species get a grand prize! This new club rewards anglers who have at least one application approved for each Catch a Florida Memory program (Grand Slams, Life List and Reel Big Fish). In addition to receiving a long sleeve performance fishing shirt custom designed by partner Tony Ivory, Triple Threat Club anglers also have the chance to win exclusive prizes. In fall 2018, the Martin County Office of Tourism and the Hutchinson Island Marriott Beach Resort & Marina in Stuart partnered to provide the perfect escape for lucky angler Michael “Soloyaker” Taylor, including three nights for two at the beautiful 200-acre resort, meals arranged and provided at various local restaurants, and a Martin County welcome bag. Submit your catches to all three Catch a Florida Memory programs for your chance to with the next Triple Threat Club prize giveaway! State all-tackle records for the heaviest fishes caught in Florida waters are maintained for 81 marine species in both conventional tackle and fly-fishing categories. Successful anglers receive a certificate and custom ink fish print courtesy of Fish Print Shop. Catches must be made according to Florida Saltwater Fishing Records program rules. As of Jan. 1, 2019, four new species were added to the program — blueline tilefish, schoolmaster, white grunt and red porgy. Catches for these newly-added species must be made on or after Jan. 1, 2019, to qualify. So go fishing and catch a record! 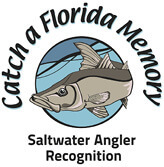 Successful Catch a Florida Memory participants are automatically entered into monthly raffle drawings for each verified submission made to the program in the last three years. Winners are randomly selected, and prizes include fish mounts from Mount This Fish Company, sunglasses from Smith Optics, rods and reels from the Fish & Wildlife Foundation of Florida, fillet knives from Smith’s Consumer Products, fishing gear from Live to Fish, nets and hats from EGO Fishing and gift certificates from Ocean Waves Sunglasses. All submitted fish must have been caught by the angler applying for recognition. Anglers must follow Florida saltwater recreational fishing regulations. Fish do not have to be harvested and we encourage catch-and-release fishing. Anglers must provide photographs of themselves with each fish submitted. Reel Big Fish applications must include a photo of fish on a length measuring device. Contributions from our generous partners help provide rewards and recognition for program participants. We gratefully acknowledge our partners: Martin County Office of Tourism, Hutchinson Island Marriott Beach Resort, CCA Florida, Mount This Fish Company, Smith Optics, McLean Angling, Smith’s Consumer Products, Live to Fish, Tony Ivory Art and Apparel, Warbird Fishing Gear, Ocean Waves Sunglasses, Fish Print Shop, EGO Fishing, Keep Em Wet Fishing, Bass Assassin, Bottom Candy, Carlos Cardenas – Marine Artist, Reel Local, and the Fish & Wildlife Foundation of Florida. To become a partner, contact AnglerRecognition@MyFWC.com or 850-487-0554.